We aren't ocean cruisers - the majority of our passages are day hops with only occasional overnight passages, so we are usually able to shop at least weekly. With only a small fridge and no freezer (we do have a tiny freezer compartment in the fridge, but it's large enough for only ice for G&Ts or a small bag of frozen peas), we try to keep our store cupboard topped up with non-perishable staples as well as some long-life foodstuffs, because we never know what will be available at our next destination. I read another cruiser's blog recently where this 'stock up when you see it' obsession was described as 'siege mentality', a phrase I thought amusing but completely true! Except when stopping for the winter, we are visiting a new place each time we drop our anchor or moor at a marina. 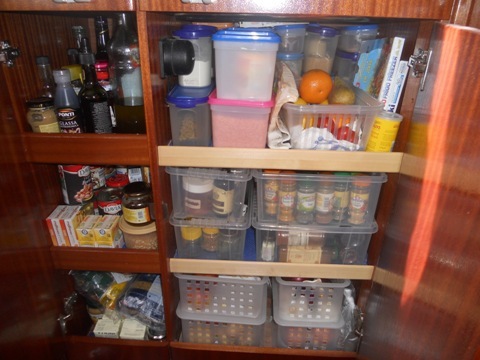 Shopping at many smaller places can obviously be quite limited and many small supermarkets have no fresh meat or fish, so having some good store cupboard ingredients and recipes is essential. We wouldn't pretend to be experts in provisioning, but some of the ideas here may be helpful to other cruisers. Our selection of dried herbs & spices is fairly extensive and takes up valuable space but is well worth it. In addition to dried beans and lentils which are great for the slow cooker as they take a lot of gas on the hob to cook, we keep at least a few tins of different beans and chickpeas. Tinned tuna and salmon, various types of rice and pasta, chorizo and other cured dry sausage/salamis, cous cous and bulgar wheat, jars of paté all have endless uses for anything from a quick lunch to a filling dinner. Flour tortillas and pita breads have a surprisingly long shelf-life so I always try to keep packets of these on hand too. There are also lots of long-life refrigerated foods like bacon and proscuitto that we use regularly as the basis for meals particularly when the fresh meat has run out and the vegetable stores are down to only the longer lasting things like root veg, squash, etc. We tend to call these our stand-by meals, but this gives the impression that they are desperation level as far as taste is concerned, when in fact, they are some of our favourites. One surprising long-life fridge stand-by is smoked salmon, which sounds extravagant as a stand-by, but actually makes a very good value meal when you consider that €3-€5 for a pack forms the base of a main meal for two with just a few other inexpensive ingredients. We've made numerous really tasty smoked salmon pasta salads (cold), hot pasta dishes and quiches. Smoked mackerel is another favourite fridge store which has a relatively long life - again great in pasta or rice dishes and makes a great paté, but we haven't yet found this outside the UK and France. Long-life cream has been available in every country we've visited to date and is great for sauces and quiches. Coconut cream, curry pastes and other Indian or Asian ingredients have been harder to find outside the UK, so I really stock up when I see them - there's that siege mentality again! However we have recently realised that Amazon sell such things, as well as many other foodstuffs, and they ship abroad, often with free delivery, so we have already received a couple of food parcels!